I like to keep up with the news in the fishing industry, and I thought this was interesting. 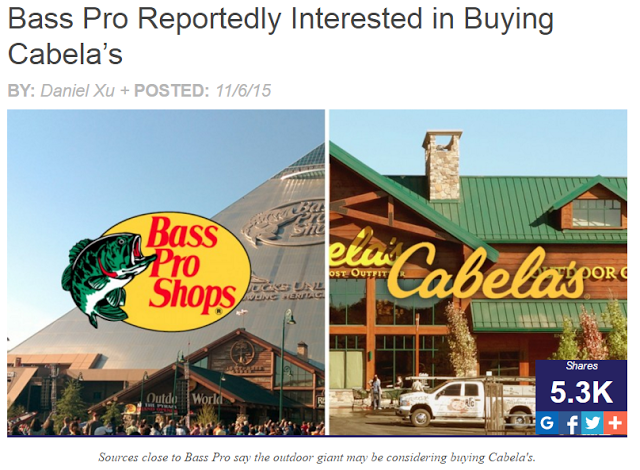 I hope it does not happen, as there a lot of things I like about Cabelas that Bass Pro likely wouldn’t continue. Fly fishing section, specific types of hooks (midge, carp, etc. ), certain lures, etc. Thoughts anyone? Read about it HERE, HERE, HERE, and anywhere else on the internet by searching “Bass Pro Cabelas”. That's disappointing because like you said, cabelas has some nice products that certainly separate themselves from Bass Pro. I know people who love their cabelas brand glass fly rods. I don't like the idea at all! Fly fishing dept period is better at cabelas then bass pro. I can usually always find what I'm looking for at cabelas regardless of what it is & usually don't at bass pro.